This month the Girl Guides movement begins celebrating its centenary and there will be many stories of the ways it has benefited the community. 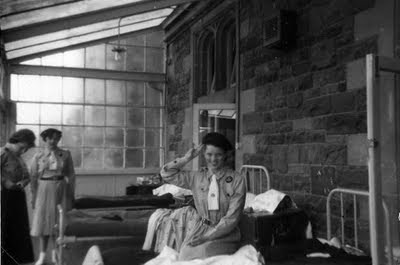 But there is one story that stands out, at least in the memories of girls who were living in an isolated TB sanatorium in a remote Welsh castle. I was one of those girls. It was our first link with the outside world , apart from monthly visitors. It gave us hope. 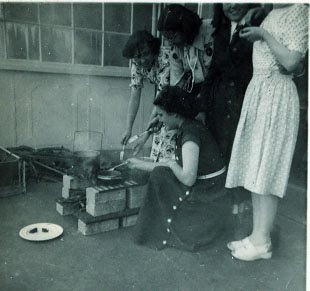 I remember how we used to cook sausages on an open fire on the balcony- something I suspect that would contravene today's Health and Safety regulations! Christine Perry ( nee Bennett) is another. 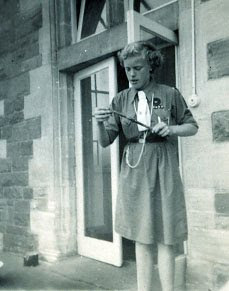 Christine excelled as a Girl Guider and became a leader, even representing the troop at a local event, the first occasion for anyone from the TB sanatorium taking part in an outside community event. "I always remember that she was carrying the standard and Sister Morgan was always worried about the clock outside the door. ‘Watch that clock, watch that clock!’ Poor Christine was worked up and down it comes, oh dear, dear. The end of the world! It was only a clock anyway." 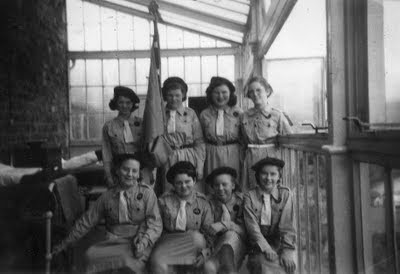 Girl Guides on Ward 2 balcony. Christine is on the far left back row. 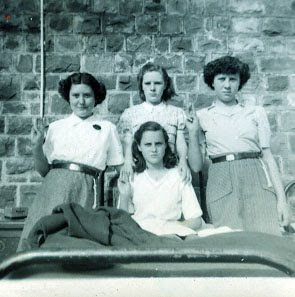 Those of us who were Girl Guiders in Craig-y-nos have very fond memories of the organisation for it brought a bit of the outside world into our isolated lives. The Girl Guide troop in Craig-y-nos is remembered with very fond memories for it was the first positive step by an outside organisation to introduce a sense of normality into lives of children removed from the outside world. Photos from the collection of Ann Shaw ( nee Rumsey) and Christine Perry ( nee Bennett).